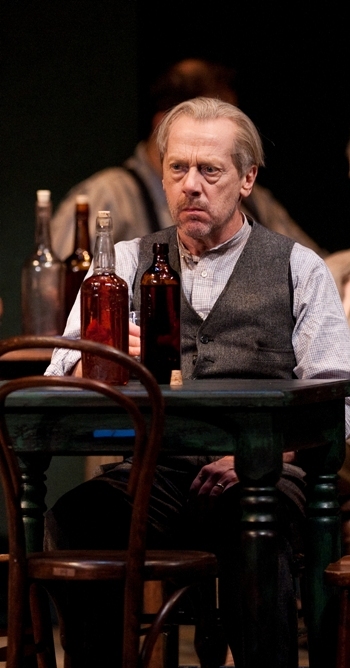 Interview: As saloon owner Harry Hope, the Stratford Shakespeare veteran drinks deeply from his first O’Neill role, at the Goodman Theatre through June 17. 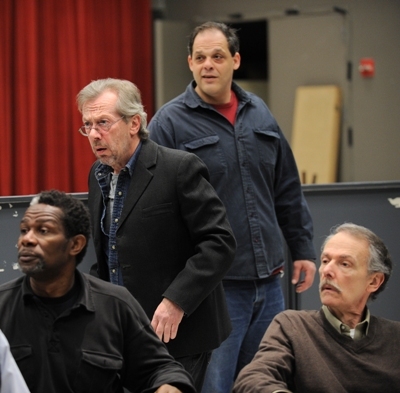 It is Harry Hope’s grumpy largesse that fuels the pipe dreams for the drunken inhabitants of Eugene O’Neill’s play “The Iceman Cometh.” And Harry, says actor Stephen Ouimette, who portrays the tragi-comic Irish saloon keeper in the Goodman Theatre’s production of “Iceman,” is one complicated lush. 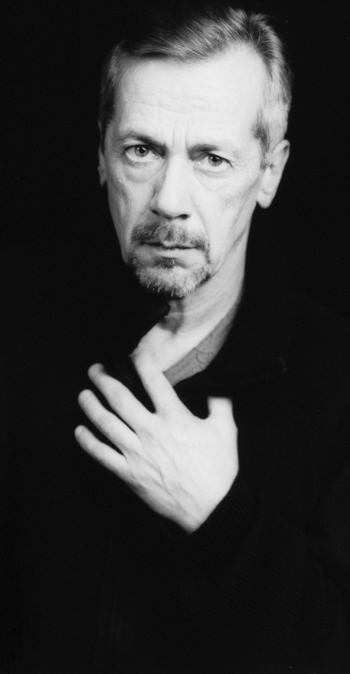 “He’s all over the place,” says Ouimette, a veteran of the Stratford Shakespeare Festival in his first O’Neill role. “I felt it from the beginning in rehearsal. Nothing seemed to line up. You can be very cranky in one moment and very generous and giving the next. And Harry’s an agoraphobic besides. He hasn’t gone outside in 20 years! That blows my mind. Yet getting a true bead on Harry Hope confronted Ouimette with one more challenge, one more interpretive layer: mastering an Irish accent, for the first time in his 35-year career. Harry Hope owns the bar, which makes him something of a success amid its boozy, escapist denizens – whose numbers indeed include Harry himself. “He was always driven to do well by Bessie (his late wife, deceased these 20 years),” says Ouimette, “but once she was gone, the little alcoholic living inside him popped right out. He has a certain amount of status. He controls the booze and sometimes he snaps at people, but they all know he doesn’t always mean what he says. The defining phrase in “Iceman” is pipe dream. The day we drop in on Harry and his pals, they’re all waiting in bleary expectation for the periodic arrival of their vindicator-designate, their only remaining link to the outside world and the greatest boozer of them all: the traveling hardware salesman Theodore Hickman, the beloved “Hickey” (Nathan Lane). This is no ordinary visit, but an occasion of parts. It is Harry Hope’s birthday – his 60th, and the 20th anniversary of dear, chiding Bessie’s death. But a stone-cold sober Hickey arrives bearing an unexpected gift: the plain truth about their pipe dreams. He has seen the light, he says, and he’s here to spread the happiness that comes with shedding illusion. “He destroys their community,” says Ouimette. “Hickey says he wants to make them as happy as he is, but in reality he isn’t happy – he’s insane. He’s like a lunatic who shows up at the hospital to fix everybody. While Hickey’s gambit sends shockwaves through Harry Hope’s saloon, and all its occupants – Harry among them – try to acknowledge their self-delusion and face the real world, the epiphany fades with the revelation of Hickey’s madness. Ouimette, who finds O’Neill’s motley band of drop-outs “incredibly appealing, incredibly real with all their foibles,” also believes Harry feels genuine affection for his sodden pals. 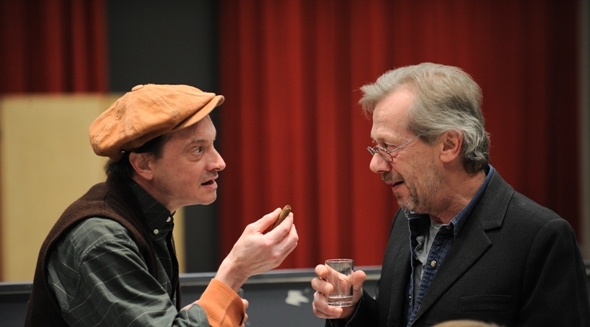 Ouimette and Dennhy were well acquainted from co-starring in productions at the Stratford Shakespeare Festival. 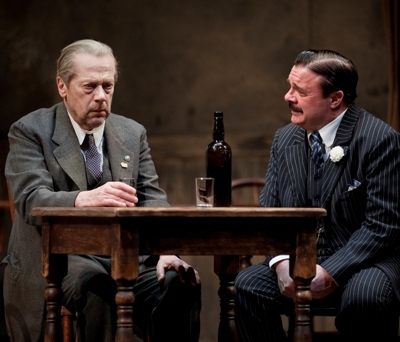 In 2011, they appeared together at Stratford in Shakespeare’s “Twelfth Night” and Harold Pinter’s “The Homecoming.” But Ouimette hadn’t worked with Nathan Lane and didn’t know what to expect from this Broadway and film star best known for musical comedy. He quickly got his answer. Of Hickey’s final, prodigious monologue, Ouimette says: “You have to sit and be dead and listen to it. It’s a meditation on madness and love and pipe dreams. It puts you in a hallucinogenic state. Hickey repeats everything over and over, but the repetitive nature is necessary to achieve that.